By CE and RoHS certification - safe and secure. No dim mode.Only 2 lighting modes--on/off. Please remove the film before use. No any street lights, any city lights, or any traffic to make it slightly more visible.  [EXCLUSIVE DESIGN] -- After we sold out 2000pcs,many feedback from lighting issues and weak weatherproof resulted, just as other sellers,so we take lots of energy to conquer all issues you are complaining! 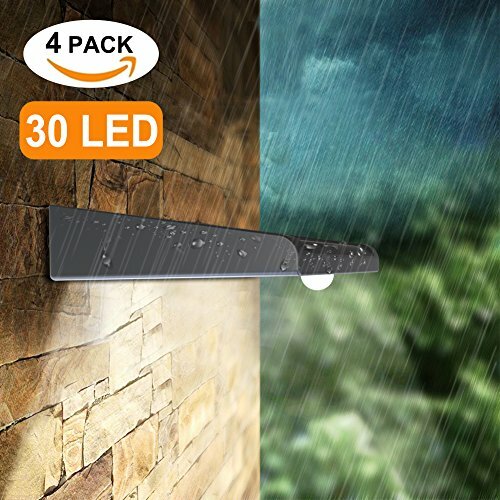 We modified the led distribution design, changed from one structure to 4 structures(As photo 3), distributed the 30 led on both sides,increased soft light broad,so no dizziness when looking straight, no water infiltration into inside when it rains,means enhanced weatherproof function. [BIGGEST Sensor Bead & POWERFUL] -- You may wondering how we are manufacturing the product carefully. We communicate with suppliers to cut larger solar panels, finalized the available size. 3.6" × 4.9",the biggest solar panels in the 30 led's market, means bigger capacity and longer working time. Meanwhile. Also adopted the largest sensor bead of small wall light, thus getting a longer sensor length of 10-26 feet with a 120 degree sensing angle.  [SIMPLE & ENJOYABLE] -- We are concerned that complex installation will affect your mood, so we simplified installation and equipped with a full set of screws, no wire and easy mounted. When motion detected, turns on automatically. No worry to turn off manually. Last for 10 seconds,then turns off automatically.The simpler, the more enjoyable.  [100% SATISFACTION GUARANTEE] -- We know that it is not enough to provide a high quality products without a good service. We promise come with a 100% Satisfaction Guarantee. Nevertheless, various uncontrollable factors may still make you stepped on lemon, no worry about that, replacement/refund per your request asap. We back our customers and products without fail and are dedicated to address any product/service issues to ensure we deliver a 5-star experience for all our customers.